As an API provider, managing the companies and developers participating in your monetized API ecosystem could be time consuming if you had to do it all yourself. There are profiles to manage; bank, tax, and billing details to maintain; roles to assign; and so on. The developer portal allows those management tasks to be handled by the companies and developers themselves while giving you full visibility into the ecosystem from the management UI and API. Before enabling self-service in your developer portal, be sure you understand the basic developer portal concepts and perform the key configuration steps. For example, it's important to know that you can control whether users are automatically activated on registration or require manual approval from you. If you haven't already, familiarize yourself with the developer portal topics in Build your portal using Drupal 7. Note: When a developer creates an app, the app belongs to the company currently selected in the portal. When developers register on the portal (clicking the Register link), they are automatically logged in (unless you want to manually approve them first) and can create their own company. They automatically become a monetization administrator of the company, and they can enter all the profile, billing, and banking information for the company. When developers navigate and perform tasks in the developer portal (accepting invitations, registering apps, and so on), they do so in the context of their own account or company membership. There's a drop-down menu to select the company they want to work in. For example, if a user selects a company and registers an app, the app is owned by the company. To manage company details (if they have administrator rights), users select Manage Companies in the drop-down menu and select the company they want to manage (or their username if they're functioning as a stand-alone developer). A company administrator can also invite developers to join their company. (The developers must already have Apigee accounts.) The following figure shows the Invite User field in the developer portal, under the company Settings > Users page. Invited developers get an email notification about the company invitation, and they can log into the portal to accept the invitation on their Manage Companies page, as shown in the following figure. Company administrators can cancel invitations to developers on the company's Settings > Users page. 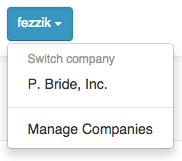 Company administrators can change the roles of developers on the company's Settings > Users page. For example, they can make a developer a Monetization Administrator to allow company administration rights. Log into the developer portal as an administrator. Select Appearance > Settings > Apigee Responsive in the admin bar. Select Components under Bootstrap Settings. Select Static Top in the Navbar Position drop-down. Click Save configuration to save the changes. If you are using your own custom theme, add the Switch Company block to your theme by selecting Structure > Blocks in the admin bar and dragging the Switch Company block to the desired region of the page. Click Save blocks to save the configuration.